Handheld and battery-operated system with room temperature microcuvette storage. 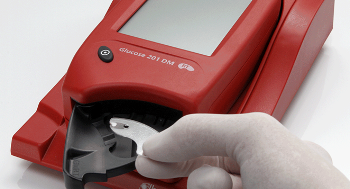 With its unique cuvette technology, the HemoCue® Glucose 201 DM RT System gives you the highest accuracy at the point of care while reducing the risk of spreading infection. Plus, you have the added controls and productivity means made possible with advanced data management. With instant data connection, customizable prompts and more, you gain tighter control of authorized use and higher efficiency in everything from patient management to billing.